The problem with halfway technologies. It can feel like we’re at a technological endpoint—but there’s more to be done. 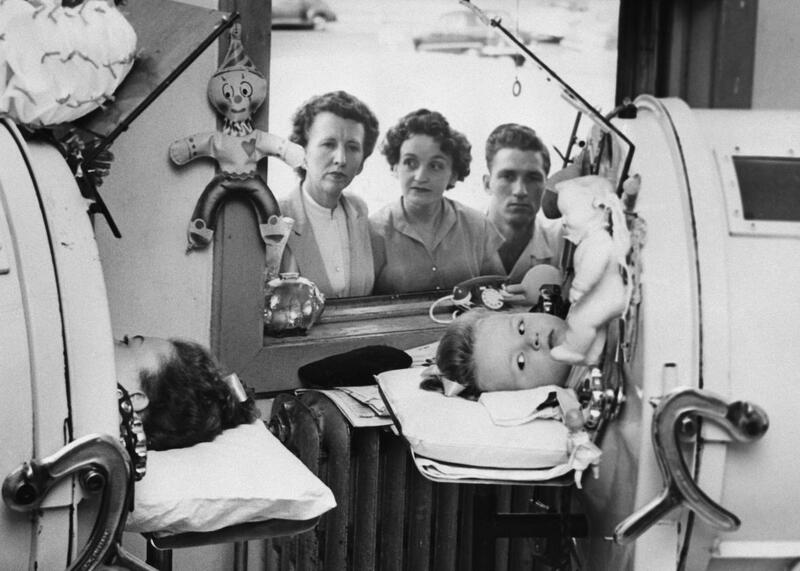 Two girls rest in iron lung machines while being treated for polio in 1952. Their family looks in from the window outside. Twenty years ago last spring, on a long Amtrak ride from Boston, I taught myself HTML and wrote my own website. It wasn’t so hard, actually, for someone like me, whose first professional word processing program was WordPerfect, in which you highlighted words as bold, for example, by typing “” before the word and “” after the word. So yeah, I had a website that I had coded with bold and italics and even a photograph in it. The photo was centered; the margins were even. I was going to be a 21st-century success before the deadline! Yu’s film, Breathing Lessons: The Life and Work of Mark O’Brien, is about a man in an iron lung. The iron lung helped people like O’Brien, an artist and writer, breathe after their neuromuscular systems had succumbed to polio. Invented in 1928, the iron lung saved lives, but it also confined its paralyzed users to mostly horizontal lives in a metal tube, sealed around their extremities, that created and released a partial vacuum inside to force air into and out of their lungs. The iron lung was a typical halfway technology—an improvement over what had been but nothing really close to what you’d truly want. That would be the Salk-Sabin vaccine. But for some, like O’Brien, halfway was the only way. They survived—and some like O’Brien did so creatively, with “an illusion of self-sufficiency” as he says in the film—in their postpolio years, as people in metal blankets. But we are constantly creating new halfway technologies. As Jeff Bezos of Amazon says, every day is Day 1 in an innovative company and an innovative society. Since most of us, however, choose technologies only from the perspective of consumers, when halfway technologies hit the market, we have the opportunity to ask ourselves some very important questions: Are we being sold a promise, an illusion, or a fad, rather than a helpful innovation? Is the trajectory we are on headed toward something that we really want from our innovation system? What alternatives might there be? Here’s a trivial example: Ministry of Supply, a hip new clothing company, markets itself to workers in the new economy. It has recently announced for sale, only available in its store in Boston’s fashionable Back Bay, a blazer extruded from a 3-D printer. The 42-short that I am, I hopefully inquired about the customizability of the sartorial splendor. But I was informed that it only came in the same small, medium, large, and extra-large sizes that standard blazers came in, and I couldn’t even shorten the sleeves on the medium because the extruded material would not take to being tailored. So, cool, a 3-D printed blazer that fails to take advantage of the profound alterability and flexibility of the design information at the heart of the heart of 3-D printing. Somewhat more profoundly, we have made great progress beyond the slow keystrokes of WordPerfect. My 10-year-old can make Siri say some really funny things, and I’m sure he’d have a blast making Apple’s new animojis from his own face. When I’m driving alone, I appreciate having directions read to me. But what I could really use is a built-in intelligence that can customize my experience with project management, video communication, and the other proliferating platforms so I don’t have to learn a new platform with each new device or project. Such an artificial intelligence shouldn’t have to be the world champion at Go. It would just have to be a little smarter and a little more patient than me. More profoundly still, the World Wide Web is itself a halfway technology. In truth, the World Wide Web is, if anything, many things. For one, the “World Wide” part remains aspirational—not quite as ironically parochial as baseball’s World Series, but not globe-covering like, say, the blanket of air that is our true global commons. Billions of people are now on Facebook, but billions more are not connected. And among the reasons those billions remain unconnected is the lack of access to cheap, reliable electricity and energy infrastructure to power devices and a similar lack of hardwired or wireless connection to the web. Recognizing this halfway nature of the web, one of my Arizona State University colleagues designs and distributes what she calls a Solar Powered Educational Learning Library—SPELL—to areas like Micronesia where schools are often simple cinder-block buildings without electricity. (Disclosure: ASU is a partner with Slate and New America in Future Tense.) Children can use teacher- or family-supplied cellphones to access a local area network projected by SPELL that serves as a web emulator, providing a trove of information that can be specifically curated for the needs of the user, for example, with local cultural and environmental content easily accessible. A second halfway aspect of the web is that although it now connects a whole lot of computers, it has only started connecting a whole lot of things that aren’t quite yet computers, or at least we don’t think of them that way. The Internet of Things could link any object that can host a chip and support a wireless connection with any and every other object that can do the same. Smart cars, smart homes, smart clothing—a whole lotta smart. This utopian vision is the digital equivalent to eliminating suffering and disease through biomedical innovation. But my experience so far with the fully informated environment is not very satisfactory. Simple stuff, like where I can get Wi-Fi—not in the men’s room at Heathrow, even though I really want to read my email and Facebook feed after a nine-hour flight. Or like Equifax, whose credit-monitoring services my credit card company recommended I retain after my identity was stolen, letting my identity get stolen again. Or continuing to get advertisements and discount offers for diapers for years after my son was out of them. Yes, it’s Day 1. We’re not there yet. But the fact of not being there means we still have choices to contemplate and decisions to make. (One choice is net neutrality, which is featured in Yu’s most recent film on the inventor of the World Wide Web, Tim Berners-Lee.) It might be the case that the World Wide Web and the Internet of Things actually don’t need to Borg the globe and that SPELL and other localized, human-attuned technologies can satisfy the necessity for equitable access that such a profound piece of infrastructure must provide. Maybe there are options for the design of these technologies that take users’ sensibilities into greater account and research agendas for A.I. in which “smart” means helpful to many rather than triumphant über alles. Technologies don’t have designated, predetermined endpoints. And these choices and decisions mean that engaging in criticism of technology and innovation is not Luddism, but rather a constructive enterprise that must happen if we don’t want to get stuck, encased in our technology, rather than liberated by it.